Review Summary: CHHODON NAA YAAR stands on a faulty script and with no face-value to magnetize cinegoers it will find the going very tough. CHHODON NAA YAAR stands on a faulty script and with no face-value to magnetize cinegoers it will find the going very tough. For that cabaret interlewd, Mahek shakes a leg (two actually), Kim Sharma sings amidst handloom umbrellas (why can’t someone give her a decent role, yaar? ), and Sheirgill waits patiently for the movie to end. Miracle: it does. The title should always summarise the content of a film. Been long since you watched a horror flick?? 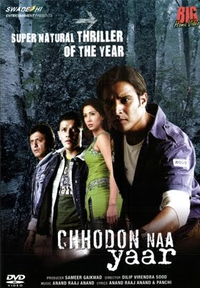 Watch the first half and 'Chhodon Na Yaar' the second half is not worth it.